U12 Blues Baker US Youth Soccer Regional Champions! ECNL Teams Punch Ticket To Virginia! As the U12 Blues Baker was getting busy in New Mexico, the last week of June all five of the Blues ECNL teams were in Seattle, Washington competing in the ECNL championship round of playoffs. The Blues were the only ECNL club in the Southwestern conference of ECNL (Southern CA, Nevada, Arizona) to have all five of their ECNL teams advance to the Seattle championships. The U14 and U18 Blues ECNL teams qualified as one of 16 top teams in ECNL for the National Championship. The U15, U16, and U17 Blues ECNL teams were also in Seattle this week playing in the Champions division of the ECNL playoffs and in breaking Blues News we are proud to report both the U15 Blues Dodge and the U17 Blues Dodge were able to qualify for championship play in Virginia in mid July. The Champions division is the highest level of competition for these three age groups. 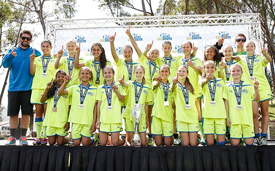 32 ECNL teams competed in the Champions division in each of the U15, U16, and U17 age groups. The winners of each of eight groups in Seattle qualified to play in the ECNL championships in Richmond, Virgina, July 13-17. Good luck to the U15 & U17 Dodge ECNL teams in their quest for the National Championship in Virginia. 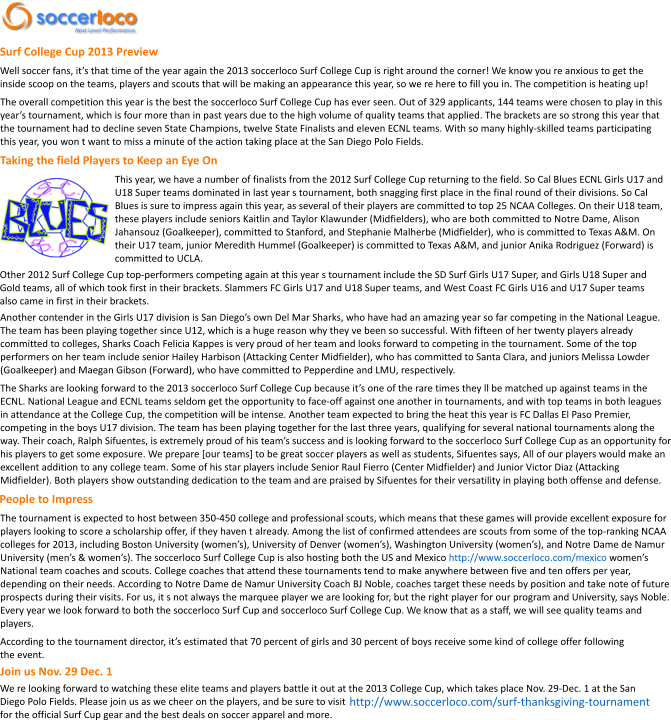 This has been an incredibly successful year for all Blues teams in league, state, and regional competition. You are all invited to take part in this success and all of our teams, players, parents, coaches, and administrators are to be congratulated. Go Blues! Unless you have been living under a rock you probably heard that over the past couple of weekends our So Cal Blues U11 and U12 Baker teams both won their respective CYSA-South State Championships. The Baker Brothers put these two teams together in successive seasons to have both be the best in their respective age groups. From their inception, the players worked towards the goal of capturing their CYSA-South State Championships. Regardless of any mistakes they may have made throughout the year the two teams peaked at the perfect time. The U11 Blues Baker team competed at several different game sites against many outstanding opponents. All of whom would have enjoyed knocking out the Lime and Blue. Early U11 Group play was a great display of the Baker team's offensive and defensive capabilities. Defensively the team had questioned themselves earlier in the season but would that carry over into the knockout stages or had they learned from their mistakes? They went on a tear against the next few opponents with shutouts proving that they were ready to focus coming into the semi and final. While they gave up a few goals in those games, they managed to hold off their competition just long enough for the attack to wear down opponents. In all the U11 Blues Baker team finished with an impressive goal differential of 28 in the eight game event. The team which was put together just under a year ago had gone through bumps and bruises only to realize that in the end they were well prepared. They found the confidence in themselves individually, they bonded as a team, they learned to trust their coaches, and finally they became champions. The U11 girls now have targets on their backs but when the time comes you can bet they will be ready to defend their title in the coming season. Until then, they can be proud of their amazing accomplishment. 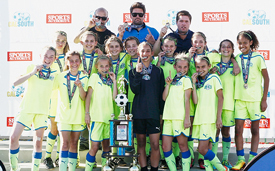 Congrats U11 Blues Baker; Cal South State Cup Champions! Not to be outdone the U12 Blues Baker were also victorious in their quest for their second straight CYSA-South State Championship. There is something that drives all championship athletes, a certain quality within that makes them want more. When you watch these girls perform you can see they have that drive and internal motivation whether it is in practice, when they compete, and you can really see it when there is a big game on the line. Defending a state title in Southern California is not an easy task and very few teams have accomplished this feat. The U12 Blues Baker was not to be denied of the defense of their title as they made their way through the demanding Cal South event knocking off teams one by one. Only giving up two goals and scoring 21 goals is proof how hard they worked on their way to a second straight State title. Combined, U12 Blues Baker is a staggering 15-0-1 with 56 goals for and only two against in their two combined championship runs. No rest for the weary, however, their celebration of the state title can only last so long. Under the guidance of the Baker Brothers these girls will get back to work in the next few months in preparation for the Far West Regional Championships which will take place this June in New Mexico. Congratulations once again and good luck in New Mexico. 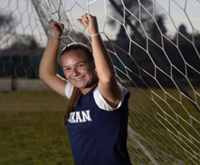 Millikan High School and So Cal Blues girls soccer player Alex Karlowitsch is the reigning Moore League Player of the Year and is on to another great season. Alex Karlowitsch's admirers, and they are legion, love what she can do with a soccer ball at her feet. They marvel over her cerebral approach to the game, her uncommon vision on the field, how she elevates the games of those around her. She can change games on her own, the most valuable commodity in the game, and then there's that shot, that rocket from distance that scorches the upper-corner netting. Alex has some special tools. They've won her a scholarship to UC Irvine, where it's anticipated she'll make an immediate impact, and recognition as one of the best club players in Southern California. And she's at the heart of what the rising Rams are achieving – and have in their sights – in what appears to be the most promising of seasons. Millikan is unbeaten through 17 games and is in a fierce battle with Wilson and Poly for the Moore League championship, and the Rams (11-0-6, 3-0-3 Moore) have bigger aims come playoff time. Karlowitsch, a solidly built, 5-foot-3 attacking midfielder who plays as a forward with the So Cal Blues. Come meet and acknowledge Alex's achievements as well as all the other talented 2014 graduates at the Blues signing ceremony at Rancho Capistrano on February 24. My name is Lauren Markwith and I've played for the Blues for the last six years. Currently I play for U16 Draluck. Last year I was invited to play soccer for the Guatemalan Youth National Team. The experience started as soon as I applied for dual citizenship. I traveled to Guatemala in October to try out for the U17 WNT. I was pretty nervous going in for the tryouts. I didn't know anyone and didn't speak the language; I know that sounds funny. I tried out at the FIFA Project Goal in Guatemala City. The first day of tryouts we lifted weights for the first hour, practice for an hour, then a scrimmage. It was very new for me to do all that activity on the same day. I was so sore from weights. I remember thinking to myself, how am I suppose to practice and play...but I sucked it up and did my best. After practice I was told that I had been selected to play and travel to Jamaica to play for the CONCACAF WCQ. OMG I was so excited and nervous at the same time. It was a very hard experience physically, mentally, and emotionally. I had to travel to Guatemala on several occasions and I learned that the culture is very different. I told my self that soccer is an international sport so that even though I did not speak Spanish fluently, everything would be ok and it was as somehow. I got the plays and was able to communicate with my teammates and coaches. In Jamaica, Guatemala was in a group of death playing against Canada, USA, and Trinidad. Canada was tough, but it was even more difficult playing against USA as I am a USA citizen born and raised, so I had to put my emotions away. On the USA team I had a couple of Blues friends (Kat Hess and Anika Rodriguez...who is in the photo) so it was fun to play against my friends and fellow Blues players. We lost to Canada and USA, but we beat Trinidad; I scored my first international goal and had my first international assist...it was such an amazing experience I was so thankful to God, my family, and Guatemala for selecting me. The coach then selected me to play for the U20 WCQ...OMG and a half. The qualifier was to be held in the Cayman Islands and we would play Jamaica, Costa Rica, and the USA. I had to travel to Guate on January, 1st 2014 to start training with the team. This time around I kind of new what to expect, but I also new that the girls would be older then me so I was still nervous. Both the U17 and U20 girls were so accepting of me. Their mentality is very different then the mentality of a 17 or 20 year old girl from the USA. They have a lot less then we do so they are very grounded, hard working, and humble. We played Jamaica and tied 0-0. Then we played Costa Rica and lost 1-5, and last but not least, we played USA... losing 0-10. Again I had mixed feelings playing against my own country, as deep down inside I wished that I was and/or could play for USA. Just like the first time when I played for the U17s, once the game began I forgot my emotions. The Chapinas (a nickname for a person from Guatemala) work so hard and have so little that I bonded with them and without knowing it I found myself with the same passion of wanting to score against the USA. The Chapinas don't have individual trainers, the right type of diet, good guidance, state-of-art facilities, or the structure that we have here in the USA. They do have incredible heart and passion for futbol and life for that matter. The coaches try, but with very limited money they do what they can. While in the Caymans the team didn't have the 5 star accommodations, or good transportation, the most modern equipment to train with, but the girls never complained about anything...not once did I hear a complaint. My teammates were all happy and grateful to be there. Overall, I learned so much on this journey. This experience has helped my soccer skills, my confidence, and my attitude. It opened a window to a view of a world where material items don't necessarily lead to happiness; rather celebrating life and the gifts we have in life become much more important. I look forward to playing soccer in the PAC-12 some day and I also hope to continue to play for the Guatemalan WNT. I want to do what I can here at home to support my WNT teammates and the success and growth of under privileged girls soccer here in the USA and in Guatemala. Thanks to the So Cal Blues for giving me the opportunity to play the sport I love with the passion of my heart!!! Vanguard University, located in nearby Costa Mesa, CA., just finished their regular season and ended 3rd in the highly competitive Golden State Athletic Conference with an overall record of 14-3. Vanguard also received a national rank of #10 at that time. Earlier in their season, Vanguard spent one week ranked #1 in the country. During the past 5 seasons, the Lions have been ranked in the top 5 in the country 4 out of those 5 years. Randy Dodge, Director of Soccer, Men & Women's Programs. Pictured just above on left is the recently installed artificial soccer field at Vanguard. The field renovation included installation of new lights, stands and futsal fields. Congratulations to the Vanguard Lions on a great season and special kudos to the Blues coaches and players that help make Vanguard the successful college soccer program it is. Blues players have many options when college decisions are made and it is nice to know there are many great opportunities locally like Vanguard University. It is with great pleasure we announce the appointment of two Blues coaches to new positions with the club. As one of the longest-tenured senior staff coaches within the club Randy has become our Technical Representative for the ECNL - Elite Clubs National League. Since joining the Blues in 1997 Randy has coached some of the top players and graduates to come through our club. Beside being a high school (Aliso Viejo) and college (Vanguard) coach Randy has won many honors as a coach including being named the LA Times High School Coach of the Year and Student Sports Magazine National Coach of the Year. Randy was responsible for leading the Blues' entrance into the ECNL when he recognized the importance of this league to our overall club's success and convinced us to join. Since joining ECNL 3 years Randy's teams have excelled at this high-level national competition. In his role Randy represents the Blues at all ECNL events as our technical expert and participates in the Annual General Meeting of ECNL to weigh in on program design and future development. Don't hesitate to congratulate Randy in his expanded role within the club. Ben is enjoying his third year with the club as coach of two Blues teams. Beyond coaching Ben has taken an active role in other major club activities and has served as Co-Director of Blues Cup for the past 2 years with Chris Cunningham. Ben also is a personal fitness and strength/conditioning trainer. Ben's new role as Operations Manager will expand his duties to assist club leadership in developing new programs including our planned in-house fitness, conditioning and injury prevention program. Ben is also taking an active role in improving our Ranch facilities and ensuring our fields are ready for game-day activity. Ben will assist our younger teams in recruiting additional players at the Baby Blues Academy level. Please welcome and support Ben with his broader and deeper role for the Blues. Dana Hills grad has one last shot at winning nationals with childhood team. 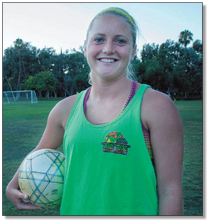 Danielle Spriggs has been a member of the Southern California Blues soccer club for roughly half her life. The 2012 Dana Hills graduate is just a few days away from closing the book on her long Blues career with the hope that the highlight of her nine-year run with the San Juan Capistrano-based girls’ club is yet to come. The squad is set to depart for the 2013 US Youth Soccer National Championships, which begin Monday and run through July 28 at Overland Park Soccer Complex in Overland Park, Kan., in what amounts to a last hurrah for Spriggs and the other players who have grown up together in the club. The team has been on the verge of a national championship twice with bids falling just short in 2009 and 2011. Their past experiences at nationals have left the Blues hungry for a title but have also made them more seasoned at the elite level and accustomed to the pressure and urgency of the moment. Experience, depth and the strong team bonds forged over the course of a decade are all in the Blues’ favor as they strive for the perfect epilogue to youth legacies that are transitioning into college careers. By the end of this tournament, Spriggs might be leaving a part of her life behind, but she and the Blues will be leaving nothing on the table. “We’ve been to Nationals twice before,” she says, “so I think everyone is really hoping that we just win it this year finally.” “There will never be another time in our life where we play with somebody for 10 years,” says Danielle Spriggs. 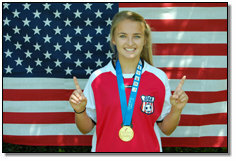 Chloe Rice from the GU16- Helm team, along with her teammates from the US women's national soccer team for the Deaf won its third straight Deaf Olympics gold medal on August 4, 2013 in Sophia , Bulgaria! The team from the United States dominated opening group pool play scoring an amazing 25 goals and shutting out all four group opponents. After defeating Great Britain 5-0 in the semifinals, a determined US squad used a strong, cohesive attack to defeat Russia 2-1, in the final match to capture a record third and consecutive Gold medal. Congratulations Chloe Rice for your hard work and success in so proudly representing our country and our club. 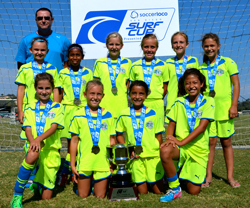 This Summer the U10 Rennie team took home the prestigious Surf Cup with some impressive statistics. Defensively they only allowed one goal against in five games at the tournament. The girls played their socks off with Blues determination and class. They won the championship match with a 1-0 result over The Fullerton Rangers with the Blues rostering only 9 players. As Coach Rob Rennie would say," Adverse Conditions". What a great group of young ladies, we are proud of you! In other Surf Cup results U13 Otto came in first place in group play and were eliminated in the semifinals, U14 Bobak Rennie also took first place in group play but were knocked out in the quarterfinals, U15 Dodge fell just short of the championship going down in defeat in the finals, U17 Dodge suffered the same fate and lost in the finals while U18 Draluck were knocked out in semifinal play. Overall it was obvious our Blues did very well competing against some of the nation's top teams. Now onto Blues Cup! In April of this year SC Blues GU15 soccer player Chloe Rice will fly to Florida to attend her first US National Team camp for the hearing impaired. Chloe will be competing for a roster spot in hopes of representing the United States this summer in Sofia, Bulgaria at the 2013 Deaf Olympics where over 122 countries will be represented. Professional soccer player and US Women's National Team member Amy Rodriguez stopped by the Ranch and the Blues Club House last week to sign her national team jersey for Cloe, to give her support, and speak with Chloe Rice about her upcoming tryouts. If you spot Chloe at the fields in the next few weeks wish her good luck. To learn more about the Deaf US Women's National Soccer Team please visit www.usdeafsoccer.com. After three years of working on attaining and then surpassing the Blues club record of 23 straight halves without allowing a goal in official games in its own age bracket, the U14 Blues R&B ECNL team was able to finally break a record which stood intact for nine years. The record was broken during the team’s three ECNL Cross Conference games in Seattle, Washington over the weekend of Sept. 28 and 29. It has been a long endeavor, with many ups and downs, but through concentrated defensive discipline the players were finally able to match the Blues club record and then surpass it. As the halftime whistle blew at the end of their 24th consecutive half without allowing a goal, they celebrated with joy and satisfaction of this special accomplishment. The record now stands at 25 halves without allowing a goal. Go for it! 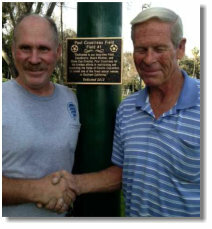 Pictured together in this photo are Paul Cousineau (left) and Steve Warriner celebrating the dedication of the Paul Cousineau field (field #1) at Rancho Capistrano. Paul is the retired long-time Board member, field supervisor, and Blues Cup Director who spent 16 years with the Blues supporting his daughters and many other families who have played with the Blues. Field #1 has been re-named the Paul Cousineau Field to honor Paul for the countless hours and dedication he contributed to maintain and build more fields at Rancho Capistrano. Steve Warriner built Field #1 nearly 25 years ago in the area that was formerly a quarter-horse race track. Subsequently, Steve built fields 2, 3, and 4 as the Blues Club and UFC grew. Ten years ago Paul Cousineau and Steve Warriner built our newest fields at Rancho Capistrano, fields 5 and 6. Together Paul and Steve dedicated themselves to create the finest soccer venue in South Orange County and continue to support soccer at Rancho Capistrano. Steve still lines all the fields for weekend games and Paul can be seen at the Ranch most weekends in the spring volunteering as a member of the Cal South State Cup Committee.